Stephanie Chen's Bundt cake looks, according to Johnny Iuzzini "like the most classic, quintessential American Bundt cake." 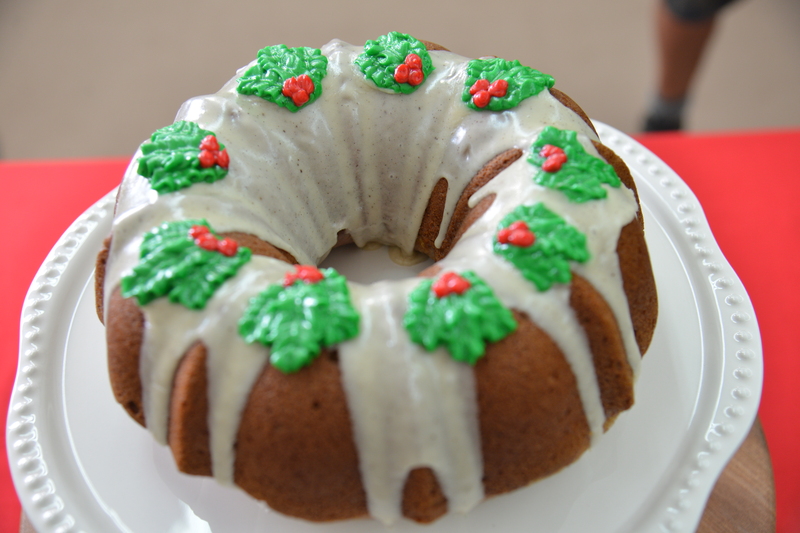 Steph used holiday flavors she loves including pumpkin and ginger to make her Pumpkin Ginger Spice Bundt Cake recipe for the Cake Week signature bake. Her cake is topped with a vanilla brown butter glaze and piped holly leaves. Will Stephanie's bake be good enough to keep her in the tent? Watch the full episode of Cake Week from Season Two Episode One of The Great American Baking Show. 1. Preheat oven to 350°F / 176°C and spray 10 cup bundt pan with nonstick spray generously. 2. In a medium bowl, combine flour, baking soda, pumpkin spices and salt then whisk together to combine. Set aside. 3. Take stand mixer bowl and combine sugar and oil together. Beat with the paddle attachment until smooth. Could take 2-3 minutes. 4. MAKE THE FILLING: Start working on filling by peeling off skin from the fresh ginger and then grate quickly with a micro plane. Place butter in a heavy small stainless steel pot to melt then turn off stove and remove from heat. Combine ginger, both sugars and slowly add in butter until just wet and combined. 5. Go back to the stand mixer and start beating in eggs, one at a time, beating well after each time. Add in vanilla extract until well combined. 6. Incorporate the flour mixture and pumpkin puree by alternating into the beaten egg, sugar & oil mixture. Start with the flour mix then pumpkin puree and let it mix well after each addition. Taste to ensure there is enough pumpkin to spice to sugar ratio. 7. Get your filling ready and start transferring cake mix into the well-greased bundt pan. 8. Add in 1/2 of your cake filling, then add a thin layer of the ginger cinnamon filling. Try to break up the sugar clumps as best as possible. Cover with the remaining amount of cake batter. Make sure you cover all the filling with mix. 9. Bake for 55-60 minutes or until took pick comes out clean. Rotate the pan half way through baking. If the top begins to brown too much, wrap the pan in foil. 10. While cake is baking, make the frosting. Place a baking sheet lined with parchment paper and place into the freezer to chill. This will be used for piping decorative holly plants. 11. Melt butter on stovetop pan over a medium low heat. Gently stir every now and then and watch it brown. Shouldn't take longer than 4-6 minutes. Do not let the butter burn! Only brown enough till you can smell nuttiness. 12. Sift powdered sugar into a stand mixer bowl and add the scraped vanilla bean pods. Gently mix together with a whisk attachment. Once brown butter is cooled, add to the mixer bowl and begin to combine together. Mixture will be very thick. 13. Slowly add in 1 tablespoon of buttermilk and 1 tablespoon of half and half. Watch consistency so frosting isn't too runny. Whip it on high till the butter and sugar come together. These will be used to pipe decorations so should be able to hold shape. If butter is too hot then put in the fridge for a minute. When it has the consistency of buttercream, take out about 1 cup and divide into two bowls. The remaining frosting will be thinned and used to pour over the cake whiles still hot. 14. Color the separated frosting with red & green the place into piping bags with couplers and wilton #66 tip (green) and a wilton #3 tip (red). 15. Remove baking sheet from freezer and pipe at least 12 holly plants on there. Make sure it's thick enough to remove later. Place back into the freezer until ready to decorate on the cake. 16. With remaining batter, add more buttermilk and half/half until mixture is thick but pourable. If mixture is still too thick and cannot be poured, add a little more milk, if it becomes too thin, add more sugar. 17. Once cake is complete, remove from oven and allow to cool in the pan on a cooling rack for 10 minutes. Shake to ensure cake isn't stuck to the pan. Invert the cake to the cooling rack and unmold from the pan. 18. Place cake in freezer for at least 15 minutes to cool. Or allow to properly cool until it's just warm to touch. 19. Pour glaze on top of cake while sitting on cooling rack with a flat cookie sheet underneath. Careful, icing may drip heavily depending on how warm cake is. Allow to come to room temp. 20. Place cake on presentation plate then decorate with buttercream holly designs.